For a while now there have been a few 3rd party sellers on Amazon selling Ridgid products; but now Amazon itself has joined in on the fun. Now Home Depot is not your only option for buying Ridgid power tools. 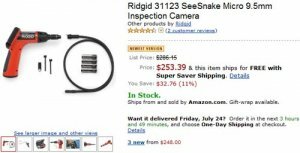 The prices do seem to be a bit higher then HD and they do not not have the complete line of Ridgid products, but if you do not have an HD in your area, Amazon might be your best bet. I can confirm that we aren't currently selling anything direct to Amazon. So this might be the reason for the extra price markup. Amazon must be buying from a middle man.